The Salomons Conference Centre in Southborough, South Kent is a beautiful building with floors to match. Set in 36 acres of gardens, woodland, rolling parkland and lakes, it was owned by Sir David Salomons, the first Jewish Lord Mayor of London in the 19th century and so has a fascinating and historic pedigree. 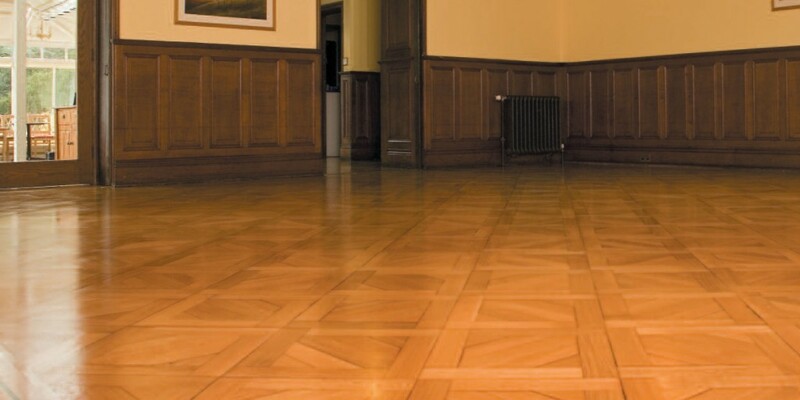 The decision was taken to refurbish the floors in the centre, resurfacing the parquet flooring with a mahogany border. The work had to be in keeping with the character and elegance of the rest of the estate and Elite Floors was commissioned to provide the best solution, using Sadolin PV67 heavy duty varnish for the job. Sadolin PV67 heavy duty varnish provides a resilient and hard wearing finish for wooden floors, and assists in the aesthetic appearance of the wood. Being extremely resistant to spills and stains, the product is suitable for all interior wood, including skirting, doors and stair rails, forming a very strong surface film. The two component acid catalysed lacquer consists of a modified urea formaldehyde/alkyd polymer, dissolved in a special mixture of solvents. It cures to a clear protective finish, and can be supplied in either satin or gloss finish. Also, its superior resistance to liquid spills and abrasion make PV67 ideally suited to use in restaurants and pubs including the bar tops.